The Relyence Knowledge Bank ends the repetition and inefficiency. The Relyence FMEA Knowledge Banktm ensures that your lessons learned from past FMEAs are always maintained and carried through all your ongoing FMEA projects. You have access to all your historical data in an easily retrievable format – meaning you can complete your FMEA tasks faster and more efficiently than ever before. The FMEA Knowledge Bank encapsulates all your historical FMEA data for reuse. The FMEA Knowledge Banktm provides a powerful way to automate your FMEA through reusing the knowledge gained from all your prior and current FMEA projects. With one click, add any FMEA information from your FMEA to your Knowledge Bank – FMEA Functions, Failure Modes, Effects, Actions, and even full components or systems. As you perform your FMEAs, use the flexible search feature to mine your Knowledge Bank for information pertinent to your analyses. Another single click, and that prior knowledge is retrieved into your current analysis. Never lose any of your critical lessons learned! Plus, rest assured that you are employing a consistent and trackable methodology to your FMEA tasks. The FMEA Knowledge Bank grows over time as you continue to perform and complete your failure analyses. You can add to your Knowledge Bank on an ongoing basis, or choose to add a completed analysis all at once. Either way, the advantage of the Knowledge Bank is the fact that your vital FMEA lessons learned are never lost. Across teams, or departments, or individuals, you can be sure that everyone has access to historical data so duplicate work and inefficiency is eliminated. Over time, your FMEA Knowledge Bank grows and becomes a powerful way to automate FMEAs. Comprehensive searching capabilities of your FMEA Knowledge Bank enable you to easily access and retrieve FMEA information. The FMEA Knowledge Bank incorporates a capable searching mechanism to allow you to mine your FMEA data for information that is applicable to your analysis. The Knowledge Bank is also flexible – enabling you to search for all levels of FMEA data. 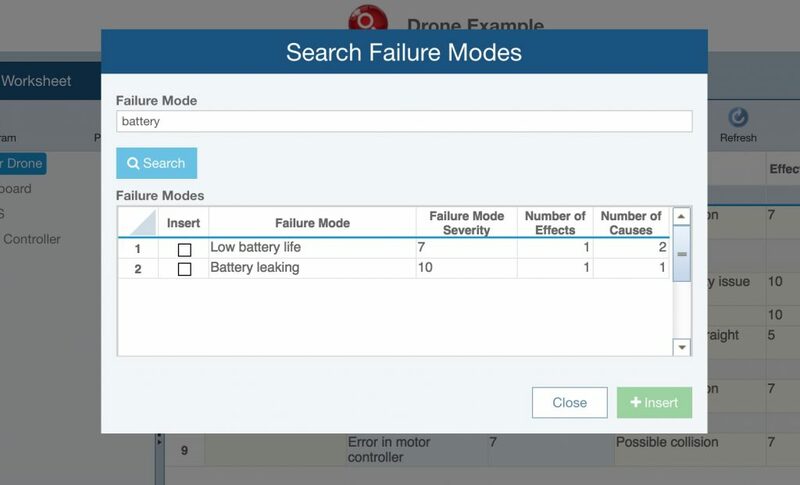 You can search for Failure Modes, Effects, Actions, and even full component FMEA data. This quick and complete access to your library of FMEA information makes your FMEA tasks more automated than ever before. Not only does the FMEA Knowledge Bank enable you to store and retrieve FMEA data to automate your FMEA activities, it also provides the ability to keep all your analyses organized and in sync. 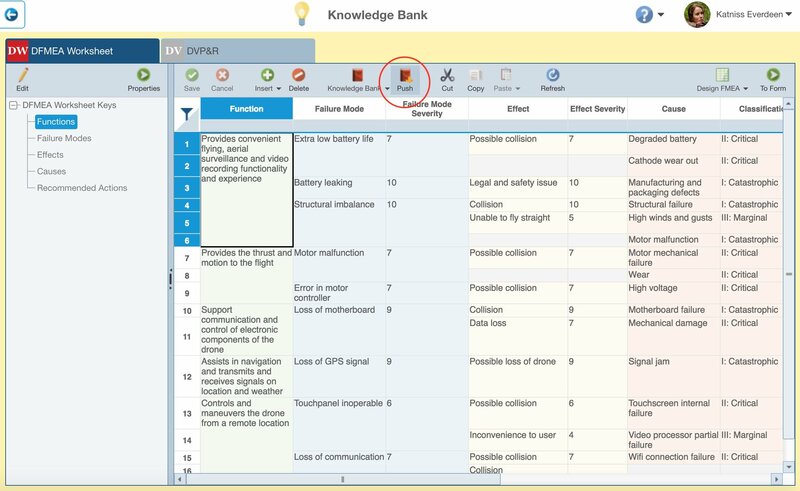 You can update the information in your Knowledge Bank at any time – directly modifying the Knowledge Bank or indirectly by updating with a FMEA Worksheet – and then optionally push these changes out to all your your FMEAs tied to the Knowledge Bank. The ability to maintain consistency in your FMEAs is an added benefit to making the most out of the Relyence FMEA Knowledge Bank capability. Use the FMEA Knowledge Bank to ensure all your FMEAs are consistent and organized.